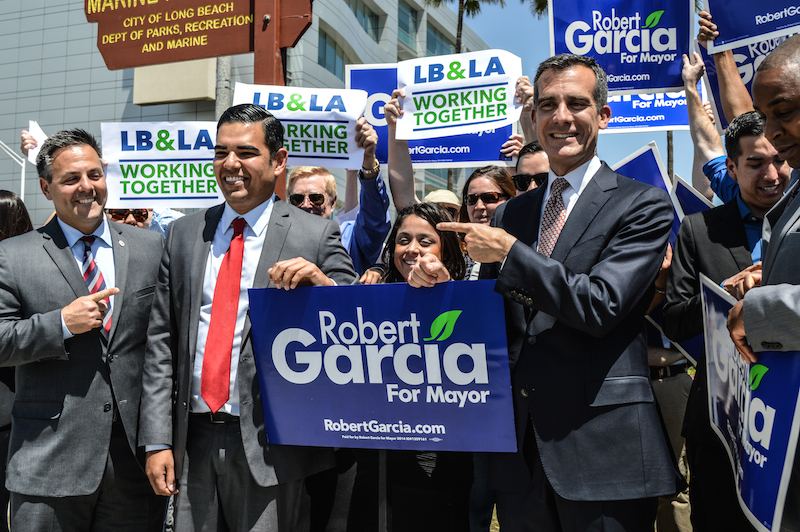 Los Angeles Mayor Eric Garcetti endorsed Long Beach mayoral candidate Robert Garcia Tuesday, calling him an example of “new leadership” with a vision for collaboration between Los Angeles County’s two largest cities. At a press conference at the Golden Shores Marine Biological Reserve, Garcetti also announced the endorsement of several other mayors from throughout the County who were not in attendance, including Bell Mayor Violeta Alvarez, Compton Mayor Aja Brown, Downey Mayor Fernando Chavez, Hawaiian Gardens Mayor Reynaldo Rodriguez, Hawthorne Mayor Chris Brown, Huntington Park Mayor Rosa Perez,and Norwalk Mayor Marcel Rodarte. Garcia, a Long Beach City Councilmember and educator, is running against businessman and former NFL player Damon Dunn in the June 3 general election. Dunn’s major endorsements include the Long Beach Firefighters Association and the Long Beach Area Chamber of Commerce. Garcia has already received big endorsements from current Long Beach Mayor Bob Foster as well as the Long Beach Police Officers Association. 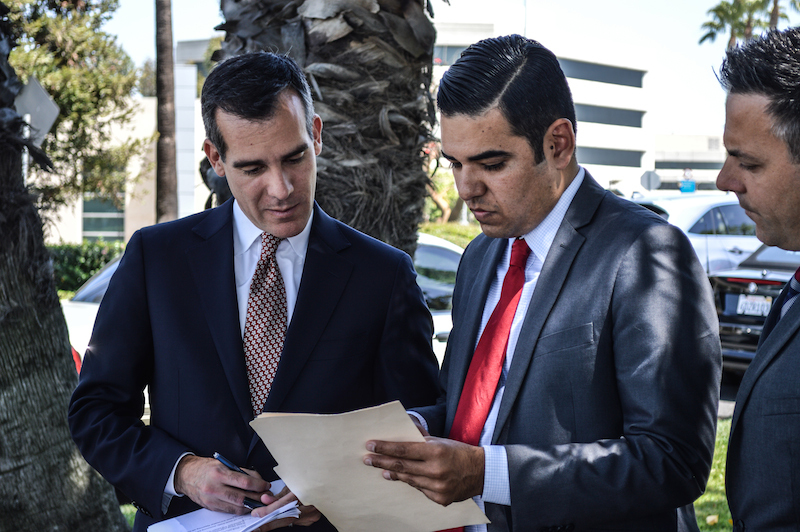 Garcetti’s support for Garcia comes less than a year after Garcia and other Long Beach councilmembers voted to pursue litigation against the City of Los Angeles over the proposed SCIG rail yard located in Los Angeles but adjacent to Long Beach’s Westside neighborhoods. Foster attended L.A. City Council meetings and condemned them for not considering the impact the project would have on Long Beach. Neither Garcia nor Garcetti discussed SCIG at the press conference, though both cited opportunities for the “sister cities” to better collaborate on issues of air quality, economic development, environmental and those concerning the twin ports of Long Beach and Los Angeles.